Sky blue aster (Aster oolentangiensis) is now in full bloom. This attractive but delicate plant is found primarily in dry to dry-mesic prairies. When we first started restoration, this species was present in small amounts on our steep south-facing slope. Kathie collected seed which we used in planting Toby's Prairie, which was the first prairie we planted. Now in its 15 growing season, Toby's Prairie is our driest planted prairie, and has a nice, diverse flora. 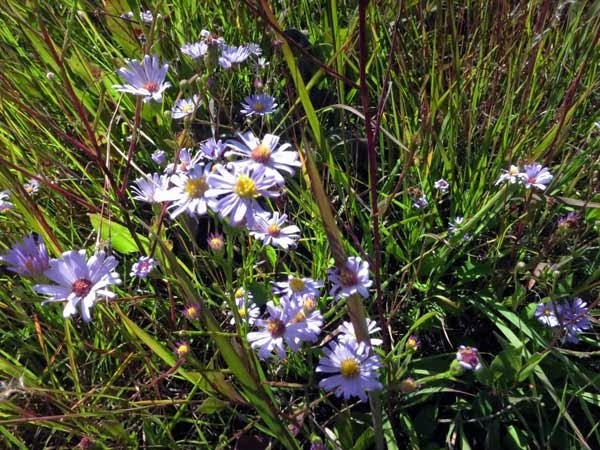 We have seen sky blue aster in this prairie since about 2002, but mostly in scattered areas. This year, probably because of the good weather, it is all over, frequently in large patches. Right now is a good time to see it. It is easy to tell sky blue aster from smooth aster (Aster laevis), another dry prairie species. The latter has clasping leaves up the stem, whereas sky blue has only basal leaves with long petioles. Most botanists know sky blue aster by the Latin name azureus, which is more descriptive. However, the rules of botanical nomenclature are strict, and the name first validly described in the literature is the one that must be used. There were two early publications describing this species, one by John L. Riddell published in April 1835, the other by Lindley in November 1835. Unfortunately, Riddell's publication came first. Riddell was one of the first botanists to visit the Midwestern states, and he described this plant from forests along the Oolentangy River near Worthington, Ohio. Thus, the species name "oolentangiensis". For details of this naming situation, the paper by Almut Jones, published in 1983 in the Bulletin of the Torrey Botanical Club (Vol. 110, pp. 39-42), should be sought. Recognizing the consternation that his paper would elicit, Jones begins his paper: "With a certain amount of regret, I am introducing evidence which will necessitate the replacement of the well-established names of two eastern North American species with names that have priority under the Rules of Nomenclature..."
Many Wisconsin plant ecologists have resisted this name change, although it is the preferred name in the Wisconsin State Herbarium. However, as an Ohio native who received his botanical training at Ohio State University, I have had no trouble with this new species name. The Oolentangy River flows through the Ohio State campus, and the first plant ecology field trip I ever attended dealt with the flora of this river. One final point: the "oo" spelling is not used for the river any more. Google etc. will try to force you to use a single "o". To do a search for the "oo" spelling, put Oolentangy in quotes. However, the correct spelling of the aster species epithet is with the "oo" and will be accepted by Google without quotes. The weather has been ideal for growth of Indian grass (Sorghastrum nutans) and all the prairies and savannas are really lush. This is quite a contrast to last year, when the drought was so bad that we hardly saw any Indian grass. At the end of last season I wondered whether the lengthy dry spell had killed all the Indian grass.Would it come back this year? We now have the answer. Indian grass (and the other warm season grasses) can survive one year of drought. Although there was little visible Indian grass at the end of last season, the root stocks were still alive and responded readily to good moisture. This result is quite a contrast to the "dust-bowl" droughts of the 1930s, which went on for four or five years. Then the warm season grasses virtually disappeared. In addition to the prairies, our savannas are also lush with Indian grass. Wherever the tree canopy is open enough, Indian grass is flourishing. 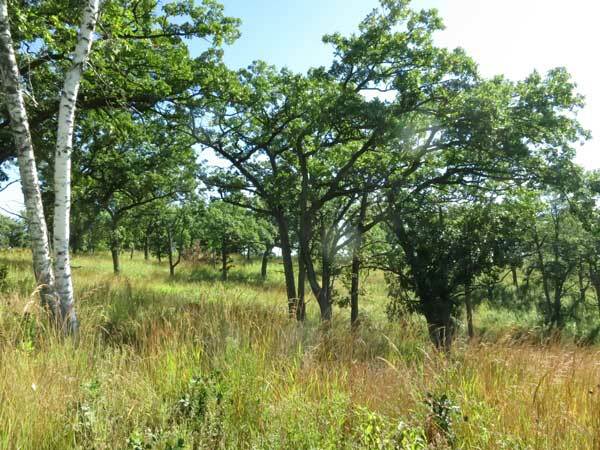 View across the ridge-top bur oak savanna (Unit 10). Wherever the canopy is open enough, Indian grass is flourishing. Sawtooth sunflower at Rettenmund Prairie out of control! Sawtooth sunflower (Helianthus grosseserratus) is predominantly a wet-mesic species but under some conditions can invade mesic sites. Although tall and showy, it is not especially desirable. Just like other sunflowers, it is clonal, spreading by shallow-rooted rhizomes. In keeping with its commonality and weedy nature, it has a Coefficient of Conservation of 2. Although we had eliminated sawtooth sunflower last year in areas we had located, suddenly it is all over the place, and mostly in habitats that would be called dry-mesic or dry. The photo here shows the dense stand along Fesenfeld Road. Although not visible in the photo, sawtooth has also spread into the high-quality prairie remnant behind. where it is starting to make substantial clones. 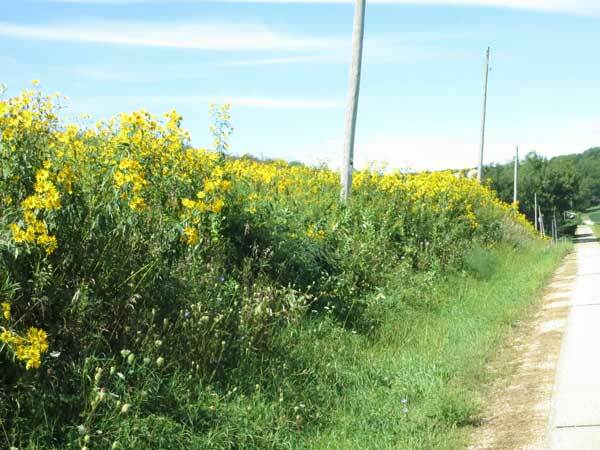 Monoculture of sawtooth sunflower along Fesenfeld Road. I suspect that these dense stands are the end result of last year's serious drought. 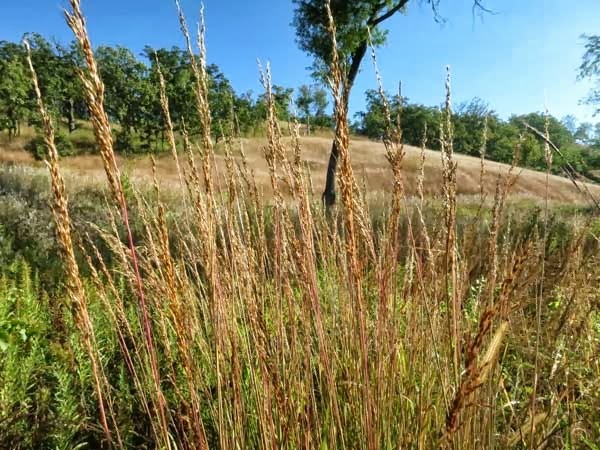 Many of our good prairie plants were killed, especially grasses such as little bluestem. Lots of bare areas were created, where sturdy plants such as sawtooth could grow and spread out. Then the very favorable rainfall this year encouraged them to flourish. While managers were spending their time monitoring for the usual culprits (sweet clover, wild parsnip), sawtooth was becoming well established. We didn't notice until it flowered. The end result is what we are seeing now. Is this a permanent replacement, or will the habitat revert to its former status? Only time will tell. In the meantime, we should be eradicating sawtooth in areas like that shown above. The only problem is that we have lots of other things to do as well. Perhaps this sawtooth patch will go away on its own?